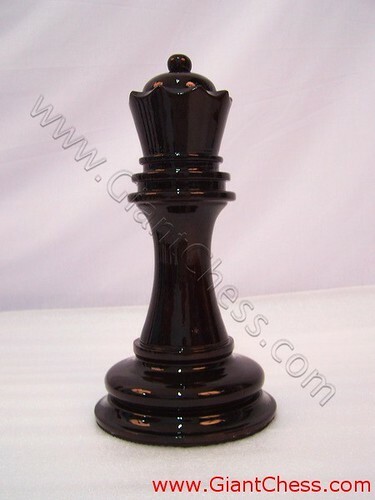 It is one of chess piece sized 12 inch, very similar to our 8 inch. This chess piece named Queen that has polished in black color. Beside used as chess game, this chess pieces also suitable for gift. May be you feel confuse about some gift in special event for one of your family, friend, or someone special. Try to give something different than other. Try to give this kind of chess pieces to them. Sure that they feel surprised and never forget. The 12 inch chess piece is easily transported to wherever one might wish to play with the others chess pieces.You just need a 6 inch x 6 inch squares of chess board to play and have an interesting game using our chess piecess set. Our chess product has made from best quality Teak wood and carved by expert craftsman. So that, our product are very durable for outdoor and indoor game. You can play chess at garden, camp, and other interesting outdoor area, in any seasons and weathers.